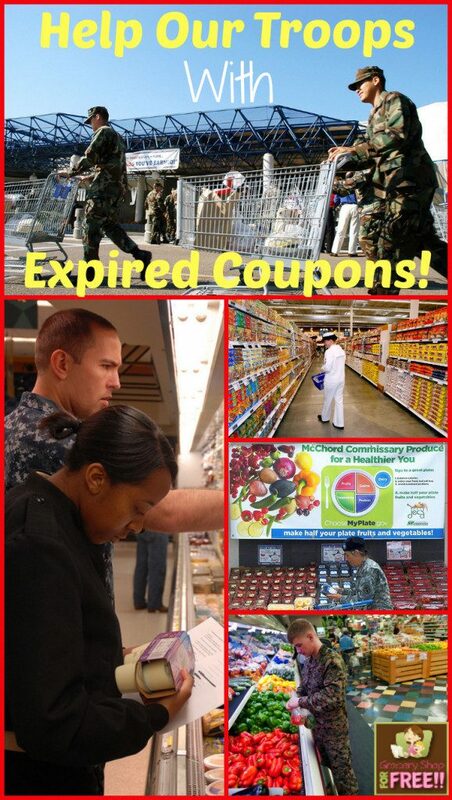 You are here: Home / Expired Coupons For Military! Kendy emailed me the other day to remind me to remind you about the Military Coupon Program. In Overseas Commissaries, Military families can use expired coupons for up to 6 months after the expiration date on the coupon! That’s great news! Well, if they have them… so, here’s where we come in! Please sort them into categories and don’t send coupons that are over about 2-3 months old. It’s hard for them to sort thru and throw away all of those coupons that are over the 6 month mark by the time they get them. I will be adding more organizations and groups as I get info from them, so keep checking back. Thank you so much for helping to spread the word for Operation Expiration. I have put together some helpful hints that usually answer most questions people have. I must tell you though, that these hints only apply to the two bases that I support (RAF Mildenhall and RAF Lakenheath). Other overseas bases may have other requirements. Must be able to see Expiration Date – If the coupon expires March 1st, we can use it until Sept 1st. Please try not to hold on to coupons too long. Some groups hold onto them until they have a full box, but then alot of the coupons at the bottom are already past the 6 months and can not be used. Sorting and cutting are NOT required, but do help – We do have some volunteers that help sort coupons, but if you would like to help, we sort them by month. We do this for two reasons. One is that it makes “cleaning house” each month easier and each family can grab a bag of coupons and get a variety of items. On average a box or large envelope will take about 7-10 days to get here. Letter and Business envelopes take about 3-4 days. During peak mailing times (such as Christmas) or a natural disaster (Icelandic volcano) times can increase. If you would like an email confirmation that we received the coupons, please put a small note with your name and email address in the box/envelope. When I pick up the coupons at the Post Office, I take some of the boxes/envelopes to our AFRC for other volunteers. Please DO NOT use staples or post it notes directly on coupons. Some post its have a very strong glue and will rip the coupon when trying to remove it. If you have any other questions, please do not hesitate to email me. We are still doing the program. I am attaching our guidelines. Since 2005, we have shipped over $18 million dollars in coupons to bases overseas and this year alone almost $5 million. We welcome your help. Is an all voluntary group whose only purpose is to collect and ship current and expired manufacturer’s coupons to our military personnel stationed at overseas bases. These folks can use these coupons at the exchange and commissary stores located on the base. We ship to over 150 military families as well as community centers on the bases. In 2012, we shipped over $7 Million in coupons and since we began in 2005, we have shipped over $35 million coupons. This info is current as of January 2013. Effective immediately, these are the only coupons we can accept. Complete coupon inserts with top sheet intact. The top sheet has an issue date printed on the spine. No loose sheets will be accepted. All coupons must be sorted by date and packaged by month using small plastic bags or junk envelopes. The oldest coupons we can accept are four months old. If the current month is August count backwards 4 months Aug-July-June-May. No coupons or inserts older than May 1 can be accepted in August. Use this “backwards counting system” each month so you do not waste your postage on coupons that we have to throw away. If you are part of a club or organization, please have someone in your group designed to make sure they are correctly trimmed and sorted. If you can sort baby coupons into a special envelope that would be very helpful. If you now sort food from non-food coupons, please continue to do that as we have one overseas base, which requires that. We CAN take internet coupons which meet the trim/date criteria. When you ship to us, please be sure to include both your name and address so we can send you a thank you letter, which always includes photos of military kids, and thank you notes from the parents.